Irish Landscape Artist and Watercolourist: Biography and Paintings. Bartlett's principal focus was landscape painting. 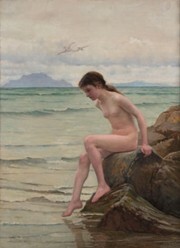 During the 1890s, he passed several summers in Connemara, County Galway drawing inspiration from the local inhabitants and rugged scenery. He completed a large number of paintings on Irish rural life and its landscape. Some of these artworks were published in The Art Journal. Bartlett painted in watercolours and exhibited at numerous Royal Hibernian Academy (RHA) exhibitions. However, few records remain of any solo shows apart from an undated "Irish Landscape Exhibition" and one at the Crawford Art Gallery, Cork. He was also an accomplished draughtsman, drawing in pencil, pen and ink and chalks. He was a member of the Royal Society of British Artists. Public collections of Bartlett's paintings are rare, as are sales of his paintings. He can be seen in Ireland at the Crawford Municipal Art Gallery in Cork. More details of William Henry Bartlett landscape paintings appear in "The Watercolours of Ireland", by Crookshank, Anne and Glin, London, (1994).  Off to the Fair, Rutland Island: Sold for £46,500 (Christie's London, 2006).  Fishing off the Coast of Ireland: Sold for £26,680 (Christie's London, 2004).  Spring Harvest Near Burton Point: Sold for £8,500 (Ross's Belfast, 2004). Information about the above William Henry Bartlett (1858-1934) is extremely hard to come by, owing in part to the existence of the more famous English painter and illustrator William Henry Bartlett (1800-1854), who also sketched and painted in Ireland and America, although only six of his paintings were exhibited at London galleries during his lifetime. Most of the latter's drawings were engraved and used as book illustrations.  For details of other West of Ireland landscape painters, see: Irish Artists: Biographies.  For more about landscape artists like William Henry Bartlett, see: Irish Art Guide.